ROADRUNNER Aircraft Weighing System Hermetically sealed, compact stainless steel load cells designed around precision strain gage load cells which fit on top of existing aircraft jacks. High strength plastic case for storage, shipping and use. System capacity range covering 15,000 to 400,000 lbs. 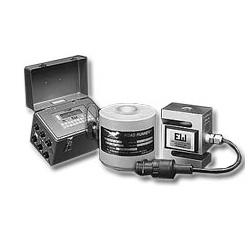 The Roadrunner Jack Point Scales feature Hermetically sealed, compact stainless steel load cells. This is an Aircraft and Helicopter Scale designed around precision strain gage load cells which fit on top of existing aircraft jacks. Weight can be displayed by individual load cell or total of any combination. Indicator is microprocessor controlled with full digital calibration. Color coded connecting cables. .7 amp circuit breaker. 12VDC internal rechargeable battery w/ 30 hour operation life. 120VAC wall mount plug. RS232 port for PC interface. The Road Runner Jack Point Weigher Systems are ideal for weighing light aircraft or helicopter after retrofitting new equipment. The easy to use Full Function indicator provides both individual wheel weight and total aircraft weight. Color coded cables and indicator connectors make it quick and easy to set-up the system and eliminate errors. This system provides easy operation and accurate weighments.